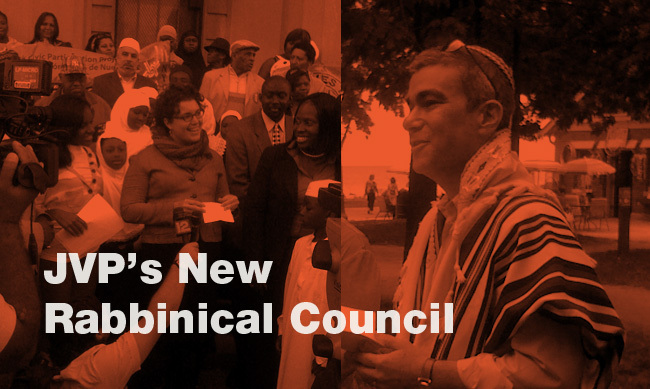 I’ve just begun serving with my good friend and colleague Rabbi Alissa Wise as co-chair of Jewish Voice for Peace’s newly launched Rabbinical Council. As readers of this blog may have surmised by now, JVP has become an increasingly important and vital organizational address for me – and I’m honored to be working with Alissa to help organize Jewish spiritual leaders on its behalf. If you’re a rabbi, rabbinical student or cantor, we invite you to sign on. You can contact us at rabbis@jvp.org. This entry was posted in Human Rights, Israel, Palestine, Peace on September 15, 2010 by Rabbi Brant Rosen. This is such an important step. Thank you all. Perhaps both sides agreeing that the same percentage of Jews be allowed in the West bank as there are Arabs in Israel & vice versa, would make the question of precisely defined borders somewhat more moot, though I favor just dividing it down the line of the highest ridge & setting the UN to keep the two apart. Setting quotas for Arabs and Jews is hardly the answer. In fact, it is rather a racist idea on both sides, and a recipe for further conflict. In any case, Jews per se are not the issue in Palestine. Israeli Jews per se are not even the issue. There have always been Jews living in the OPT in Palestinian towns and villages who have been completely welcome, and there are even some Israelis living there who are welcome. The problem is the illegal colonization of occupied Palestinian (and Syrian) land by Israel. As for your “highest ridge” idea, Israel’s border as called for in UNSC Resolution 242 and other international legal instruments is the green line, with some modifications to make for a straighter border, not “the highest ridge” or “whatever Israel decides” or “wherever Israel can get away with building a wall. This is such great news, and how timely, during the High Holidays. It is encouraging to know that there are Rabbis who are committed to upholding the Jewish values of truth and justice, and that despite the fear and risks it might require to speak out, they are doing it despite (or because) of this. Indeed, it should fall upon all of us to be responsible and to speak out.